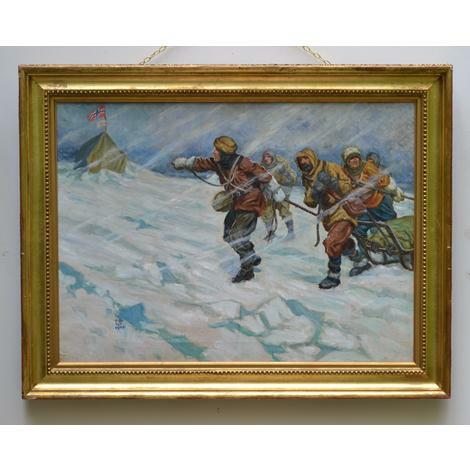 A little over fifty years before this painting was executed, Robert Falcon Scott reached the South Pole. A month earlier, Roald Amundsen had done the same. Here is pictured the moment that Scott and his companions, Wilson, Bowers, Oates and Evans, discover the Norwegian flag flying on a tent that had been erected by Amundsen. In fact, Scott and his party had realised that they had been beaten into second place the day before they reached the Pole; but this painting is about registering the psychological drama of that 'terrible disappointment'. And it does that with great power. In the context of the joyful irreverence of much of Robinson's output, this painting takes on added substance. It is powerful in its compositional simplicity and its painterliness and fully exploits the theatrical art of the expressive gesture. The enveloping wastes of blizzard and ice aptly convey the Scott's own perception that this was a, 'terrible place'. It might be thought curious that this picture is dated 1953: the year the British Everest expedition, in the persons of Edmund Hillary and Tenzing Norgay, became the first to reach the top of Everest, in May; the year the new Queen, Elizabeth II, was crowned, in June. But, February, 1953 was also fifty years after the news of the loss of Scott and his companions had been told to the world. Robinson was, perhaps, reflecting on his own old age and - after having endured two World Wars - on the fickleness of fate. 'I should have a tale to tell of hardihood, endurance, and courage of my companions which would have stirred the heart of every Englishman'.